Title Series: Yahari Ore no Seishun Love Comedy wa Machigatteiru. If someone is trying to calm you down, they are not telling the truth. If there is a reason anyone is smiling, it is to cover a lie. If a rabbit is about to be eaten by a pack of wolves, it is the rabbit's fault for trying to become friends with them. 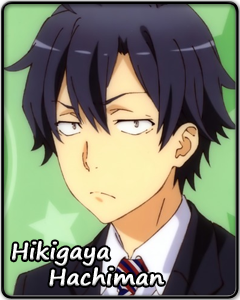 Hikigaya Hachiman is treated as an outcast by his peers, but he does not care. The only reason he goes to school is for the degree. Anything from joining a club to making friends is not on his list of things to do during high school, and he prefers it that way. Volunteer work or giving people advice is the last thing Hachiman wants to do. Why would he waste his time helping a complete stranger do something that he or she probably could have done himself or herself with enough effort? Yet Hachiman would still complete the task, even if there is nothing in it for him. What makes Hachiman dangerous is the way he does things. He will tell people things they do not want to hear, speak up and inquire about what everyone else was silently thinking about, and set fire to the feelings welled up inside others who have tried to keep them secret. Hachiman will take all the stares, all the hits, all the verbal abuse, and he will not flinch. He will do whatever it takes to get people off their feet and do as they are told. When he returns to that quiet room to prepare himself for the aftermath of his actions, a new sticker on that sign means maybe what he did has its merits.